When you’re experiencing this issue, it is most probably caused by asymmetric routing. In short this means that the interface that has received a packet doesn’t respond to the source of the packet by itself but via another interface. While this causes one of the interfaces to be unavailable from the outside on Red Hat based distributions, the problems with asymmetric routing also do exist on the other distributions although it seems to work fine. Asymmetric routing isn’t a big problem but it can cause issues related to NAT on firewalls and it has some impact on network performance. 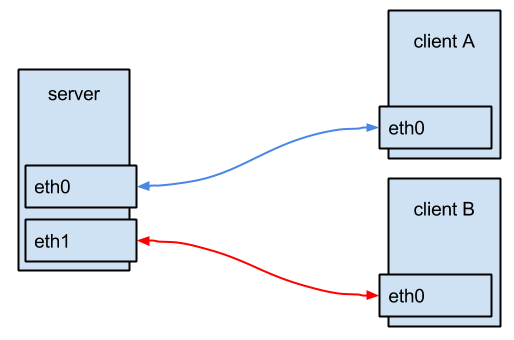 The above image shows asymmetric routing: a packet sent from client A to the server, enters the server via network-interface eth0 but, due to the routing, it’s routed back to client A via interface eth1 of the server. For the client, it looks like everything is working normal. Packets do flow in and out from the server. 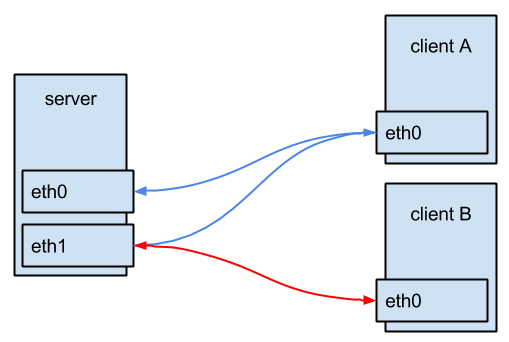 It’s clear that interface eth1 will have a higher load that eth0 and while you’re thinking that you have two full 1Gbit interfaces, the speed is limited to the speed of eth1. Since RHEL 6 (and CentOS 6), asymmetric routing doesn’t work anymore out of the box. The cause of the issue is a change in the default value for kernel parameter rp_filter. Rp_filter stands for reverse path filtering. The reverse path filter will check if the source of a packet that was received on a certain interface is reachable trough the same interface it was received. The purpose is to prevent spoofed packets, with a changed source address, not being processed/routed further. In a router it could also prevent routing packets that have a private IP as source to the internet as they obviously will never find their way back. Since RHEL 6 and its derivative CentOS 6, rp_filter, which can be controlled by kernel parameters, is set on a default value of 1. This means that the rp_filter is operational in strict mode and does exactly what it is designed for. 2: Loose mode, only discards the packet when it isn’t routable over any of the interfaces on the host. To test this behavior, I set up a system that is connected to two networks: 192.168.0.0/24 and 192.168.1.0/24. I have a client in both networks and a client which is in another network. [jensd@server ~]$ ip a|grep "inet "
[jensd@clienta ~]$ ip a|grep "inet "
[jensd@clientb ~]$ ip a|grep "inet "
[jensd@clientc ~]# ip a|grep "inet "
As you can see, both IP’s are reachable from within the same network but only one, the one that has it’s default gateway in the routing table, is reachable from other networks. In the output from the server, you can see that rp_filter for both interfaces has a value of 1, strict mode. The easiest solution is just to change the value of rp_filter to allow packets to flow out of another interface that the source interface. Besides the quick solution, there is also a better solution. While changing the value for rp_filter is getting both interfaces and IP-addresses to respond from other networks, the setup is still asymmetric. The best solution is to get rid of the asymmetric routing and let each interface route it’s own packets to the default gateway. Each interface on the server should have it’s own default gateway, which allows that interface to reply itself to incoming packets from other networks. A normal routing table can only have one default gateway. This is quite logical since it’s the place where to send packets that do not match anything else in the rest of the table. To be able to have two default gateways, one for each interface, you need to setup policy based routing. Policy based routing allows you to have multiple routing tables. Which table is used, depends on a set of rules. To setup policy based routing for our example case, we will use two policy based tables. While it is possible to give a nice name to the tables (in /etc/iproute2/rt_tables), it’s not really when you only plan to have a few. Without a name, the tables are automatically created when you’re adding something to them. Let’s start with adding a route for the network itself (link) and one for the default gateway for each interface. ens192 (192.168.0.10) will use table 1, ens224 (192.168.1.10) will use table 2. As you can see in the output from ip rule show, our policy based tables have a higher priority than the main table, which can be viewed with ip route. Nevertheless it’s import to still have a default route in the main table since packets leaving the machine itself can have a source IP of 0.0.0.0 and would not match any of the rules in our policy. Now your configuration should be persistent. While this solution is slightly more work than changing the value for rp_filter, it isn’t that hard and has a lot of advantages over the other solution. This entry was posted in CentOS, Debian, Kernel, Linux, Network, Red Hat, RHEL, TCP/IP by jensd. Bookmark the permalink. Hey, how do I make the routing tables persist after reboot? Hi, I edited the post to include instructions for this. I forgot this in the original post. It’s not working, I still have to enter the commands after reboot. And moreover, it messed up 2 of my network connections (1 nic with multiple aliases), I had to reset them from Network Settings in GUI. Sorry but without any knowledge of your exact config it’s hard to tell exactly what you need to do. The commands and config in this post are what I setup and tested. The idea is that you get the principle and you can use it as an example but you’ll have to adjust it to fit for your needs. I think the problem with this is that while you are creating your initial tables with ‘ip route add’ that it’s not persistent in with the reboot. You probably want to manually add these tables to rt_tables prior? orientalsniper: On centos 7 to get this to stick use: net.ipv4.conf.all.rp_filter = 2 (all instead of default) in /etc/sysctl.conf worked for me. Thanks for writing this post! We ran into this problem at work, and this helped to identify and properly resolve the issue real quick. Author might want to update the article with this information. Many thanks for this post!! I spent hours to try and figure why two nics in different vlans wasn’t working properly, while in old CentOS 5 it worked fine. Both solutions here solved these problems! What if “ens224” interface is getting IP via DHCP? How to make the rule? Nice catch. And a good question. I would need to look into this but for sure you could generate the rule-files using a script which is filling in the leased ip dynamically. how does this apply to earlier versions of redhat like version 5.2? IB0 is an infiniband connection to a separate subnet 192.168.100.x this network is local and doesn’t goto the firewall. I need clients on the 10.0.3.x network to have access to the server without going through the firewall, as the speed through the firewall is horribly slow due to packets being analyzed. and then having the clients that happen to be macs connect via nfs to the server using that ip address 10.0.3.5, however I’m worried about causing broadcast storms or other issues. Hello I just what to ask if there is any way that Client A and B can ping one another in this scence. Thanks a lot. The ability for client A & B to ping each other is not really relevant for this article. Both clients should have a route (or via the default route) to each others subnet. In case you want routing to be done by the server, you will need to add routes on the clients for that. What you’re looking for is not really what this post is about. You should search for a guide to configure NAT and port forwarding. This will allow you to reach the local addresses from the public IP and to reach the public network from the local addresses. What if server have 3 NICs? 2 the same as in this case and third (i.e. eth2 and IP 10.10.0.1) is connected to Internet. You would need to add another entry for the 3rd card. Same for iptables and masquerade, you will need to specify the interface names on your iptables statements. Persistent routing and rules won’t work without following package. Anyway thank you very much for this article! The actual difference between for example Debian and RHEL6/7 systems is, that Debian does not have rp_filter enabled AT ALL and it’s configured to a default value of 0. There is no packet forwarding needed. What rp_filter actually does – each incoming packet is tested against the FIB (Forwarding Information Base) and if the interface is not the best reverse path the packet check will fail. By default failed packets are discarded. Changing the rp_filter value to 0 would change the behavior to the way Debian works without the need of enabling the packet forwarding, but having this on a value of 1 is currently a recommended practice in RFC3704 to prevent IP spoofing from DDos attacks. Learning the IP routing behavior and to know how to define a ruleset should be a must-read for all IT admins.